While we all hope to avoid accidents or the need to report an insurance claim, it is important to understand the process if/when a situation occurs. 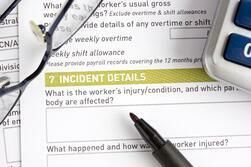 Below are step-by-step instructions to help you navigate the road to reporting a claim. Who: Who is involved in the claim? Obtain names, addresses and phone numbers of those actively involved. What: What happened? Write down details while the event is fresh in your mind, and avoid listening to other's statements as they may be misleading. Where: Where did the claim happen? On your premises or somewhere else that you performed the work? On what street, in what town, etc.? When: When did the claim happen? Document the time of the accident. When did you do the work for the claimant? Additional Information: Was anyone hurt (be sure to document their name)? Were the police contacted (number on police report, when it will be available)? Do you have any photos, driver statements, or estimates for repairs that you can send us for when this is reported to the company? If this is a Work Comp Claim (injury while on the job): The employer will need to complete a 'First Report of Injury' form and get it to the carrier/agency. For additional information about reporting a claim, contact your KnowledgeBroker. We are here to make the process as seamless and effective as possible.